It snowed. Finally! And was absolutely freezing. I only appreciate bad weather (and what I refer to as bad weather is coldness and rain) is sitting indoors warm, gazing out of the window adoring from a distance. But I had a meeting that day and shockingly was happy and comfortable that I went for a walk across the road on bond Street, I slipped twice which oddly I found funny. I think with this unorthodox personality I have I find the majority of things funny! 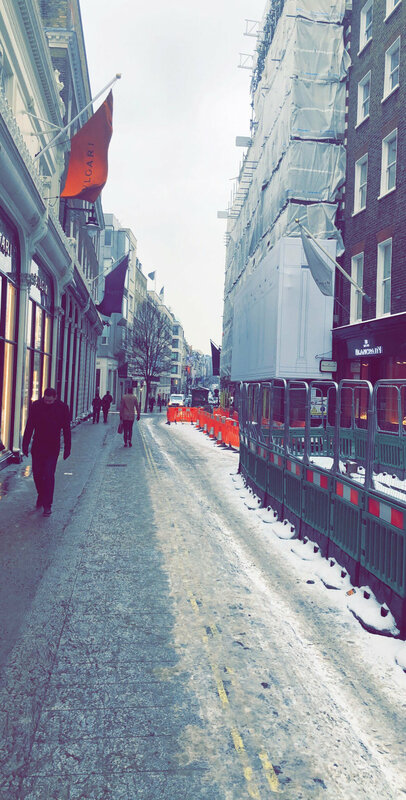 A lot of people abroad commented at how shocked they were at seeing how cold London looked and at how long it snowed for, it snowed on and off for the whole week. I wore trainers, I wish I had copied my mummy and worn boots with grips!! As long as your hands, feet and neck are covered warmly and of course wearing a coat you're fine in the cold!